The Grands Montets summit staircase, built in the ‘90’s by the staff of the SATAL, has finished its useful life, where the weather conditions have taken their toll. 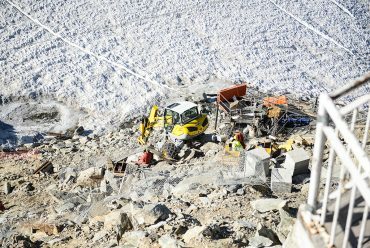 The entire staircase is to be replaced & its access will be re-situated so as not to divide the terrace of the Grands Montets bistrot with skiers constantly crossing the terrace to reach the staircase down to the snow. Access will therefore be more comfortable & in line with the present norms. The new stairs will be above the previous installation, closer to the real position on the pass. The steps themselves will be more uniform & slightly higher above the ground so as to avoid the upward pressure of the snow below, to be cleared by the ski patrollers. The steps will be covered by mats & a stainless steel handrail is provided. The demolition of the lower part of the previous staircase (where it will cross the new one) is underway. A specific access path for climbers has been created for this summer season. The new installation will be completed at the end of October by “Accro-BPT” for the preparatory engineering & “Joly & Philippe” for the construction & installation of the staircase. Nothing will remain of the previous stairs, the debris being transported by helicopter to the valley floor.